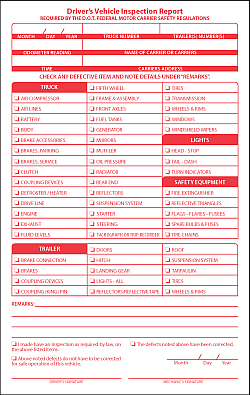 The Federal DOT Federal Motor Carriers Safety Regulation §396.11 Requires that every motor carrier driver carry out an inspection of their vehicle on a daily basis. SEF, Inc., can provide you with a variety of motor carrier forms including, Daily Vehicle Inspection Reports, Driver's Daily Log Books, forms which combine both, or custom forms typeset to your customers specifications, and or course, you may supply your own artwork. These forms can be bound in books, three hole punched and shipped shrink-wrapped for use in notebooks or any other format that you customer may require. We can also supply you with a blank inspection form that your customer can fill out on the PC or by hand for a truly custom daily vehicle inspection form. Call our customer service at 800-633-1228 for a quote today.